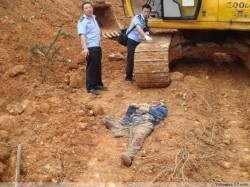 Recently, this set of chilling photos was circulating the Chinese websites and forums with the title “Peasant worker crushed into meat pie by excavator, where is justice”. Was it a murder or another housing demolition gone bad? Netizents speculated. Then I found the news report of this incident on Netease. Tens of thousands of migrant peasant workers are full of hope, with a good heart, constantly going into the city, selling out themselves to the unlimited consumption of low-cost labor force. They are selling their physical strength, their health and their time, and how many of them will really fulfill their wishes?